For other uses, see Jičín (disambiguation). Jičín (Czech pronunciation: [ˈjɪtʃiːn]; German: Titschein, Gitschin or Jitschin; Latin: Gitmiacinum, Gitzinum; Polish: Jiczyn) is a town in the Hradec Králové Region of the Czech Republic. It lies approximately 85 km northeast of Prague in the scenic region of the Bohemian Paradise (Český ráj) under the Prachov Rocks (Prachovské skály). Jičín has been declared a Municipal Reserve (městská památková rezervace) because of its well-preserved historical center, built around a rectangular square with a regular Gothic street layout, remnants of fortifications and arcade Renaissance and Baroque houses. The town is also connected with the popular fairy-tale character of Rumcajs. The Battle of Gitschin was fought nearby during the Austro-Prussian War of 1866. The surrounding countryside was settled by Slavic tribes at the beginning of the 6th century. The town of Jičín was probably founded at the end of the 12th century, in the place of today's village of Staré Místo (i.e. Old Place), under the castle of Veliš. It was moved two km northward to its present location shortly afterward, which was better protected by the Cidlina River. The first written reference of Jičín comes from a document by the wife of King Wenceslaus II of Bohemia, Queen Guta (Jitka), dated August 1, 1293. It is believed that the town was named after her (meaning Guta's town, Jitčino město in Czech). The town was built with a regular street layout around a rectangular square and was surrounded by wooden fortifications with reinforced bastions and a trench. Jičín was first property of the king, but during most of the 14th century and at the beginning of the 15th century it belonged to the House of Vartenberk. When the town was founded two churches were built, a wooden parish church at the southwestern corner of the square and the stone Church of St. James the Great with a cemetery at the southeastern corner. The first was rebuilt in stone into the Parish Church of St. Ignatius at the end of the 14th century. During the 15th century Jičín changed its lords several times until it became a property of the House of Trčka of Lípa [cs] (1487–1607). With the succession of Vilém Trčka in 1453, the town began to be rebuilt in stone. The fortifications were rebuilt as well, with three gates connecting the center with peripheries: the western Prague Gate (1577), the northern Holín Gate, and the eastern Valdice Gate (1568), which is the only one preserved today. After a large fire in 1572, most of the wooden houses were replaced by stone Renaissance buildings, often decorated with sgrafitoes; the parish church was rebuilt as well. In the second half of the 16th century, a small palace of the House of Trčka was built on the southern side of the square, together with a similar Hetman's house on Lesser Square (Malé náměstí). The palace was completely rebuilt by Zikmund Smiřický in 1607, but was badly damaged by a fire after an explosion. The biggest expansion of the town started in 1621 during the Thirty Years' War, when the town became a property of the generalissimo Albrecht von Wallenstein, who made it the center of his Duchy of Friedland and minted his own coins there. Several architects worked for him, notably G. Marini, A. Spezza, G. Pieroni, and, since 1630, N. Sebregondi. He had the palace (locally known as Zámek, i.e. château) and the Church of St. James rebuilt completely in the North-Italian style and connected them via a roofed footbridge. The church, intended as a seat of a never-established bishopric, has never been completed, so it lacks a spire and a cupola. The town was to be rebuilt completely into a modern town with separated representative and craftsman parts. The letter was placed into the New Town started in 1624 to the north of the central square with the Church of St. Mary de Sale and a new cemetery. Much of these plans remained unfilled due to the early death of Wallenstein in 1634, after which the town lost much of its importance. The parish Church of St. Ignatius together with the college was given to the Jesuits in 1627. The construction of a villa with a loggia (Libosad) was started to the northeast of the center in 1630. There was a Baroque garden in front of it and a park around. It is connected with the town by a 1.7 km-long alley of linden trees. Near Libosad, in the current village of Valdice, a Carthusian monastery with the Church of Assumption was founded in 1627. It served as the tomb of the house of Wallenstein until 1785; today the monastery is used as a prison. In 1710 the town became a property of the House of Trauttmansdorff, which meant the arrival of the period of High Baroque, during which many constructions were completed. Many statues and sculptures in the town today come from this period. In 1784 Jičín became the seat of a new region. During the first half of the 19th century the town spread quickly, especially eastward. 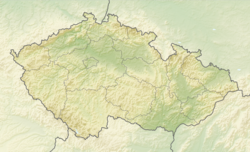 Until 1918, the town was part of the Austrian monarchy (Austria side after the compromise of 1867), head of the JICIN - JIČIN district, one of the 94 Bezirkshauptmannschaften in Bohemia. In the second half of the 19th century, many Neo-Renaissance houses were built. After World War II, during communist rule, many prefabricated apartment complexes sprung up around the town. LB was the latest princess of the kingdom. ^ Městský úřad Jičín. Partnerská města [on-line]. December 6, 2012 [June 26, 2016]. Available at: <https://mujicin.cz/vismo/zobraz_dok.asp?id_org=5954&id_ktg=28067&n=partnerska-mesta>. Wikimedia Commons has media related to Jičín.